Over recent years Grosvenor has become noted for the promotion of so-called ‘minority’ collecting areas, achieving many record results along the way. Dr Conrad Graham, who died last year, was one of Britain’s foremost cinderella philatelists and the auction of his collection on April 21st created exceptional interest. This was a very special day with high levels of pre-sale bidding, a packed auction room and determined competition for each lot throughout the sale. The £460,739 sale total represented a doubling of the pre-sale estimate. Up for sale was a remarkable ‘old-school’ collection, a lifetime’s search for scarce and esoteric philatelic material, particularly Revenues, Telegraphs, Cinderellas, Locals and Postal Orders, groups of Russian Zemstvos, Chinese Municipal Posts and propaganda forgeries caught the eye as they soared upward and the star item proved to be the Great Britain Post Office Telegraph 1877 £5 plate proof in black (lot 496) which rose to £5,894. 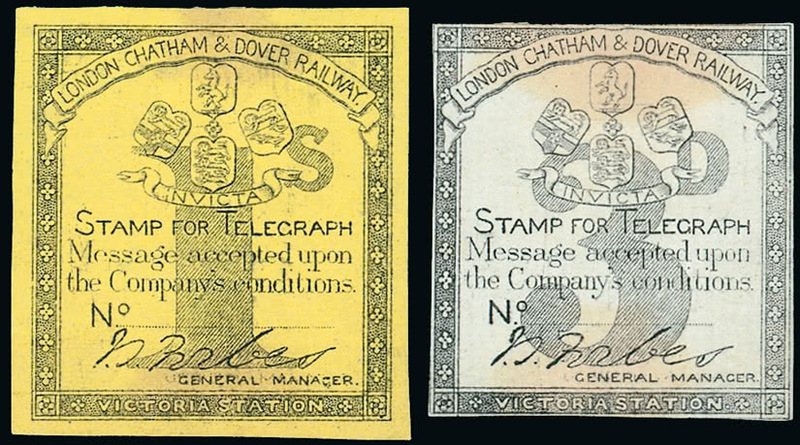 Amongst a most impressive offering of private telegraph company stamps, the London Chatham & Dover Railway Co. 3d. black on yellow and 1s. black on greyish paper attracted great interest (lot 365). Fewer than ten examples of each of these now exist and their new owner was obliged to pay £4,666 to secure this pair. In the Specialised Great Britain auction on April 22nd the line engraved section of lots was strong, groups and individual 1d. blacks being in notably good demand. Postal history was less reliable although certain covers did do well. 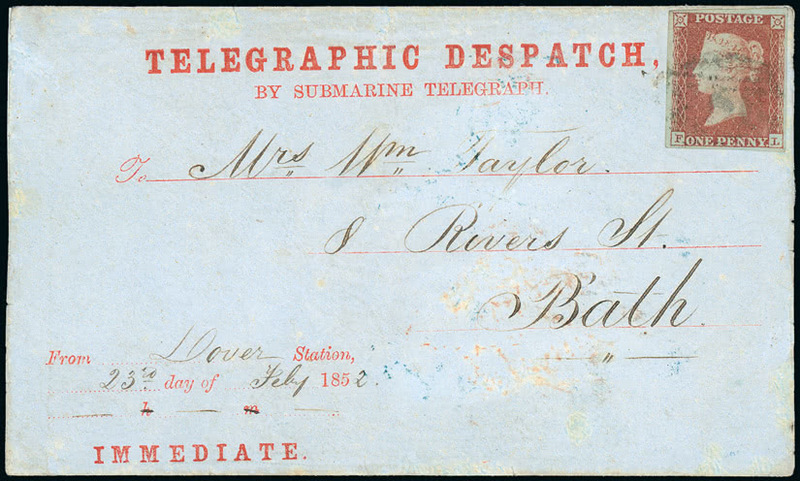 One most interesting item was the 1852 Submarine Telegraph Company envelope addressed to Bath bearing an 1841 imperforate 1d. 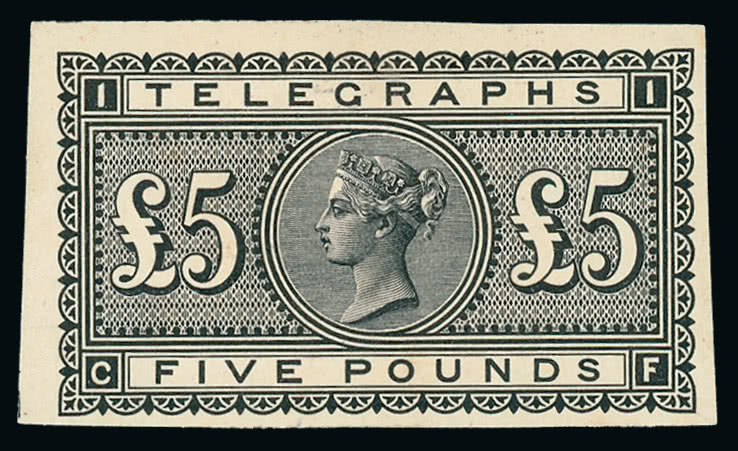 red and with enclosed cross-channel telegraphic message (lot 1150) which achieved £7,368. Demand for Q.E.II varieties has become somewhat inconsistent though the great rarities are still popular. 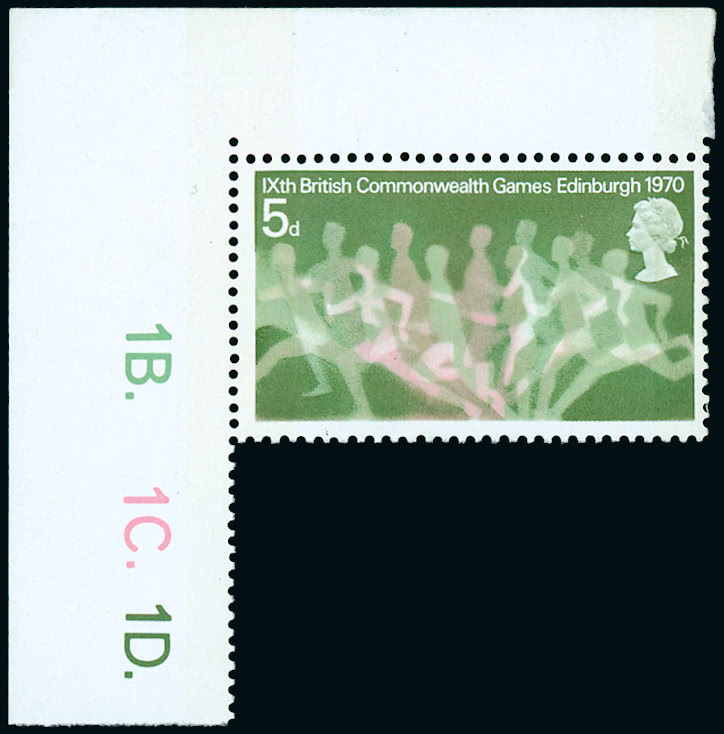 Only three mint examples are known (one damaged) of the 1970 Commonwealth Games 5d. greenish yellow omitted variety, however, so the £11,052 paid for the corner marginal example also showing cylinder number missing (lot 2143, left) was expected and well merited. The Grosvenor Spring 2015 season will conclude with two further auctions, British Empire & Foreign Countries on June 3rd and the Rev. Roger de Lacy-Spencer Collection of Railway Stamps on June 4th.